Mix all the ingredients except crackers. 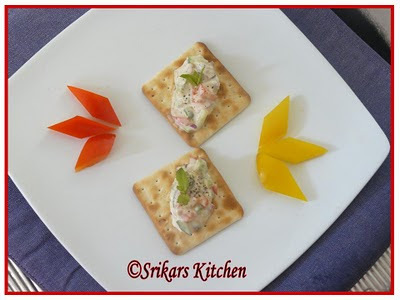 Arrange the crackers & add cheese mix on top. what a quick comment ?? A great snack, can be made in no time....Kids would love it ! wounderfull and delicious snacks...kids love it. My son would love this !!! looks so cute. Beautiful and cute bites, looks sooo cheesy..